Today I had some really strange experiences while deploying some SharePoint application using a custom build WSP file. First, I tried to re-deploy an existing solution, but that didn’t seem to succed. At least my SharePoint site replied with a “Service unavailable” notice. So I though, I should retract the solution – maybe someting in my updated solution broke my SharePoint site. also just failed on me. So next I was stuck. I couldn’t neither delete the solution nor retry to retract the solution because everytime I got the message, that another job is currently retracting this solution. This is why I couldn’t do anything at the moment. But what now? It didn’t seem like the was any other job running. This actually remove the solution – but I had to find, that this wasn’t the cause for my “service unavailable”. So all this for nothing! The strange thing about that is, that only one out of a dozen websites was not working. Then it strike me – looking at the IIS admin I found, that the app-pool associated with this SharePoint site was stopped – restarting the app-pool solved my “service unavailable” immediately. 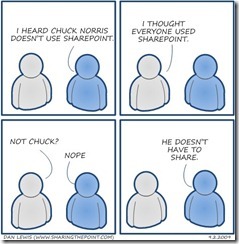 Chuck Norris never starts an Approval workflow in SharePoint. Chuck doesn’t need approval. Chuck Norris isn’t afraid to customize, one look and SharePoint runs at peak performance. Putting Chuck Norris in the SharePoint Visitors group is futile. Chuck always has Full Control. Chuck Norris doesn’t have a SharePoint Disaster Recovery Plan. He doesn’t recover data, only hostages. Chuck does not subscribe to Alerts. He knows what is happening before it happens. Chuck Norris IS the Governance Plan. In SharePoint 2010, the Farm Administrators group is being renamed to ‘Chuck’s Group’. Chuck Norris never get’s unexpected errors with SharePoint because he is always ready for everything. Chuck Norris doesn’t prepare for SharePoint 2010. SharePoint 2010 prepares for him. 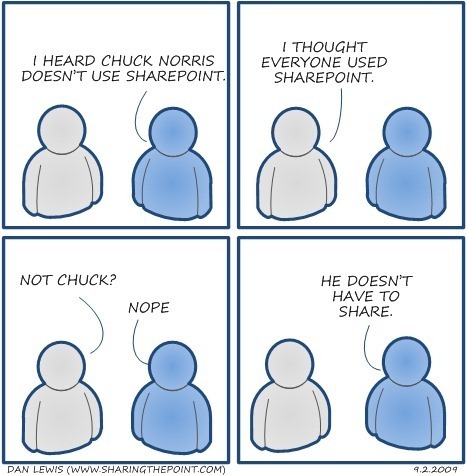 SharePoint 2010 was a Chuck Norris idea.